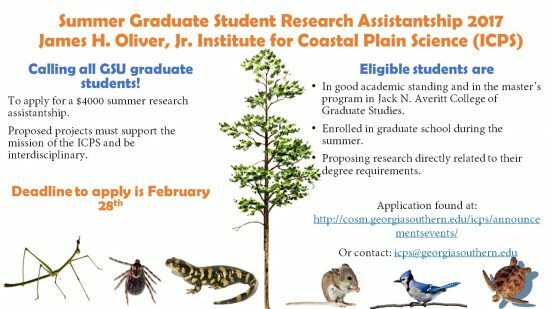 The James H. Oliver, Jr. Institute for Coastal Plain Science (ICPS) invites Georgia Southern University graduate students in any scientific discipline to apply for a $4,000 summer research assistantship to support his/her thesis research efforts. Two such awards will be made on a competitive basis in summer 2017 with priority given to projects of high quality that fulfill the mission of the ICPS. Students in scientific disciplines who are in good academic standing in the master’s program in the Jack N. Averitt College of Graduate Studies are eligible. BS or BA students who have been accepted into the Master of Science program at Georgia Southern and will clearly be in the graduate portion of their degree program during the summer of support are also eligible. The research proposed should be directly related to the applicant’s completion of degree requirements and a student may receive this form of support only once. Deadline to apply is February 28, 2017. Applications will not be accepted after the deadline.